Two classic Italian olives. Part of a mediterranean diet. 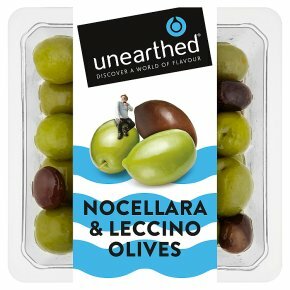 Suitable for vegetarians.Our Food Discoveries Nocellara & Leccino Olives We're always on the lookout for something different, so when we discovered that no one in the UK had thought of this mouth-watering mix of Nocellara and Leccino Olives we knew what we had to do. Delicately flavoured Leccino Olives are from Tuscany, while the rich, buttery Nocellara olive comes from Sicily. We love the contrast of flavour and texture, and we think you will too.